Whatever the billboards and print ads say from this point forward, one thing remains clear: the Bluffton state of mind isn’t going anywhere. See for yourself with a stroll through Old Town’s classic Lowcountry streetscapes in company with (shall we say…eclectic?) locals, in the shade of venerable live oaks and May River air, past Calhoun Street’s rustic art galleries, and through the doors into Vineyard 55 for a bite and a beer…or a glass of wine or two. Wood floors, leather chairs, wine racks, and a porch—not a deck, not a patio, a porch—presiding over Calhoun Street; everything about it, including the menu, says Bluffton. “We get a lot of wanderers for lunch,” said manager Cassie Robinson. “People doing the walking tour, coming from Savannah, coming from the island. At night, it’s a very local place, mostly folks from the neighborhood.” To that last point, it’s the strange dynamic between two towns, Hilton Head Island and Bluffton, with only a bridge between them. The reason people stay all night is music—live, local music every Wednesday through Saturday night, including familiar names like the Chiggers, Neil & Bob, and Jeff Beasley. Well, that and more than 80 beer selections to enjoy on premise or take home in a growler. “Just tell ’em live music, craft beer, and wine,” Rinaldi said. “And we’re hosting the Pink Partini on June 17,” he added. Okay, but let’s throw in great food too, and some aptly named cocktails like the Calhoun Kir, Porch Punch, State of Mind, and Pluff Mud Punch, and it’s definitely worth a trip over the bridge. 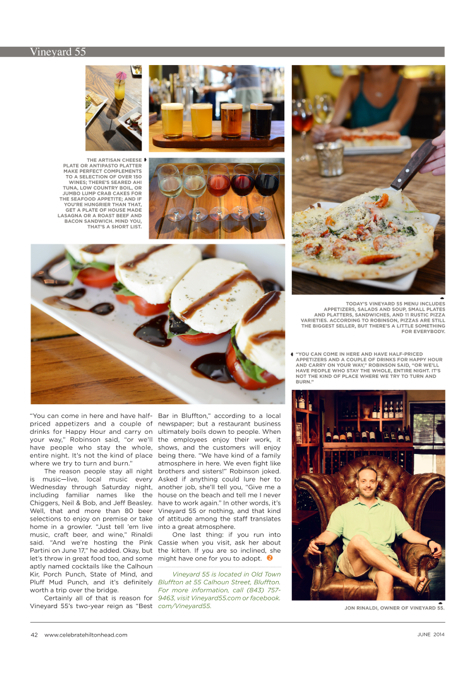 Certainly all of that is reason for Vineyard 55’s two-year reign as “Best Bar in Bluffton,” according to a local newspaper; but a restaurant business ultimately boils down to people. When the employees enjoy their work, it shows, and the customers will enjoy being there. “We have kind of a family atmosphere in here. We even fight like brothers and sisters!” Robinson joked. Asked if anything could lure her to another job, she’ll tell you, “Give me a house on the beach and tell me I never have to work again.” In other words, it’s Vineyard 55 or nothing, and that kind of attitude among the staff translates into a great atmosphere. One last thing: if you run into Cassie when you visit, ask her about the kitten. If you are so inclined, she might have one for you to adopt. 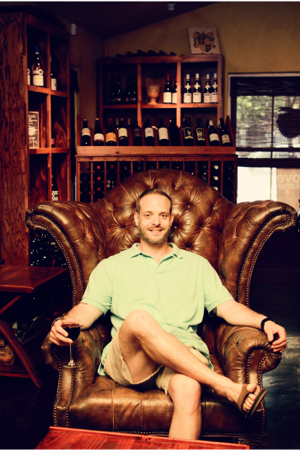 Jon Rinaldi, Owner of Vineyard 55. 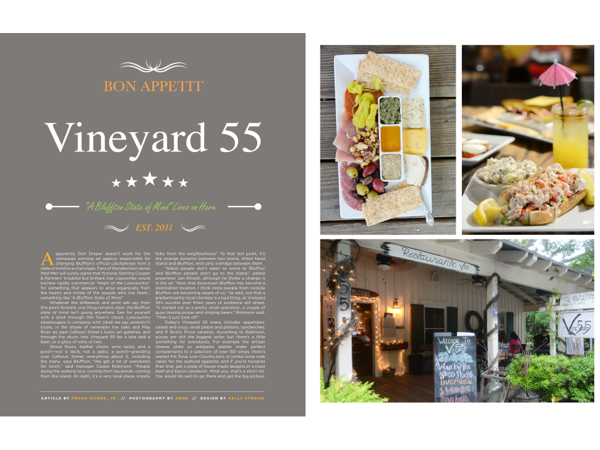 Vineyard 55 is located in Old Town Bluffton at 55 Calhoun Street, Bluffton. For more information, call (843) 757-9463, visit Vineyard55.com or facebook.com/Vineyard55.